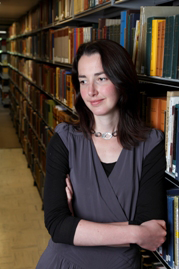 Rebecca Bullard works on the literary culture of seventeenth and eighteenth century England. Her current research project focuses on the concept of 'the gathered text'. 2008: ‘Textual disruption in Anna Trapnel’s Report and Plea (1654)’. The Seventeenth Century 23:1 (Spring 2008), pp. 34-53. 2009: The Politics of Disclosure, 1674-1725: Secret History Narratives. London: Pickering and Chatto. 2010: ‘”A bright Coelestiall mind”: a new set of writings by Lady Dorothy Browne (1621-85)’, The Huntington Library Quarterly. 2010: ‘Politics, Secret History and the Novel’, The Oxford Handbook of the Eighteenth-Century Novel, ed. J. A. Downie, Oxford University Press, à paraître.